This world and the people in it are not perfect. Circumstances often arise that we don’t want, wish or enjoy. What makes or breaks these moments is how we handle them. It’s not just about the unwanted times of life but how we choose to react to them. Think back on your life so far. What has shaped you the most? Yes, the high and low moments of happiness, tragedy, success or failure are big. But digging deeper, what truly impacts us is how we choose to think, act, and move forward from those monumental events. The big moments are catalysts which cause us to react and eventually adapt. How we react depends on how we think. How we think isn’t about intelligence or talent. Our thinking and subsequent reactions stem from our overall attitude. How do we see this world and all that’s in it? Events and people can shape our attitude but ultimately this is something we alone control. Whether life throws us lemons or roses, what we do with them depends on our attitude. Lemon moments can either cause us to lament our plight or make some lemonade. Rose petal moments of life are often easier to take in stride. But these matter too. When life is going well, how can we share and make someone else’s day smell a little more fragrant? What we choose in every moment stems from our unique perspective. If there’s one constant in this life, it’s change. How we deal with the changing events, people and things that will come our way impacts not only our moments, but also how we remember them. Studies have shown those with a positive and sunnier outlook on life tend to have better memories. They adapt to the bad and embrace the good. 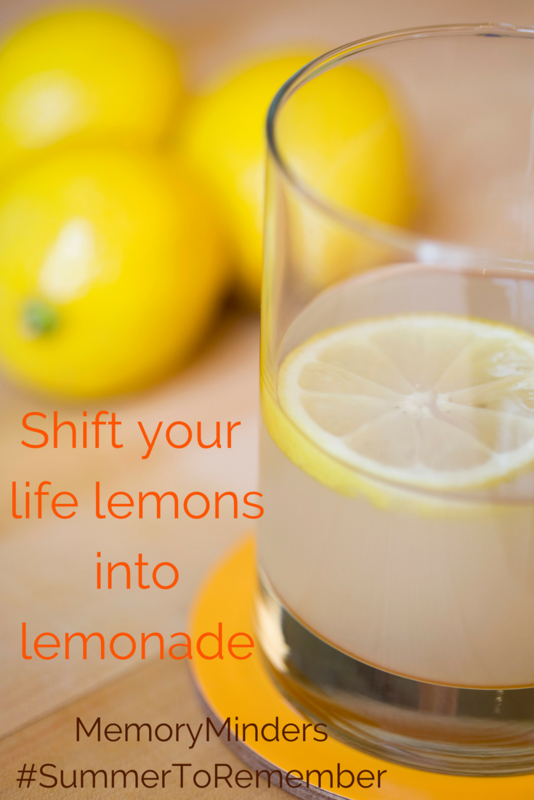 In this #SummerToRemember maybe you’ve experienced moments of change or had to make lemonade out of unwanted lemons. Me too. But let’s remember that no matter what comes our way, we can always control our thoughts and actions. Our attitude determines what we think, say, and do. If we keep it focused on our blessings and the positives of life we can make any batch of lemons into lemonade. So what will it be-sour lemons or refreshing lemonade? Choose to see the positives in any situation, especially the sour ones. Let’s choose to be creative and understand what we can learn or how we can grow from the unwanted or challenging experiences of life. When we shift from problems to finding solutions and learning from life’s lemon moments, we engage our brain, think differently, and ultimately help our memories. So as summer wanes and we sip our lemonade, let’s remember how lemonade begins-with sour lemons. Any situation can be made into a memorable moment simply by shifting our attitude. That seems like a much better way to live while making it a #SummerToRemember. Great comment using lemonade as a subject. Jill. I loved this post. Simply said but these days I like simple. Great! I’m so glad it was helpful Tammy!